Kids will enjoy peeling the backing and affixing this versatile foam to paper or other backgrounds. 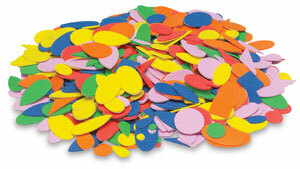 The assorted shapes come in a variety of sizes and 10 assorted bright colors. This bag contains 720 pieces. Assorted shapes come in a variety of sizes and 10 assorted bright colors. This bag contains 720 pieces.